Sometimes I feel like I work in a bubble gum factory when coming up with these combinations! The truth is that most fruits are naturally delicious and combine with each other well, so it’s great fun to make these drinks. I highly encourage you to experiment with as many fruits as you have access to. This sweet and tangy fruit infused water requires muddling, so use ametal muddler or wood muddler to smash all of the juice out of your blackberries. 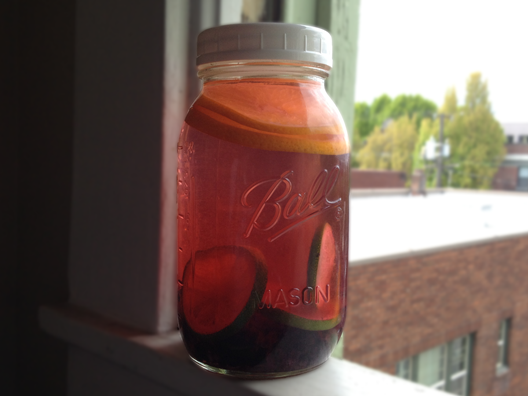 Recipe for a 32 ounce Ball jar: 10 blackberries, muddled + 3 slices organic lime + 2 slices organic orange. 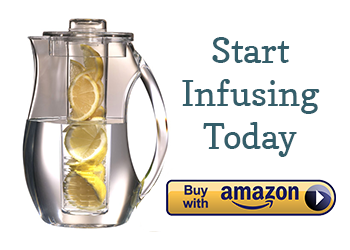 Fill with purified water and let chill for 4-8 hours. You may want to strain before drinking to avoid the blackberry pieces. P.S. I just found these plastic tops for my Ball jars and I’m already in love. They don’t rust, are dishwasher-safe, BPA-free, and just all around more attractive than the metal tops.